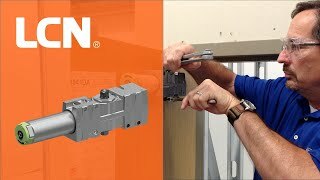 This LCN 4040XP-RW/PA heavy duty door closer is supplied with Tri-Pak arm which includes a regular arm for hinge side and top jamb mount applications and a parallel arm bracket for parallel arm mount on push side. The XP series provides extra protection for real world applications. The LCN 4040XP replaces and retrofits the 4041 closer. A stronger more durable door closer you will not find! The LCN 4040XP, by far, surpasses all standards to serve the openings of the real world that are extremely susceptible to abuse. This closer replaces and retrofits the old 4041 closer and it can be used with all 4041 accessories. The Tri-Pak arm allows for flexibility in the mounting.